Summer holidays are here and with it the risks pets experience . . . long trips and hot days, fireworks and getting lost. There are two reputable microchip identification companies in South Africa. When implanting a microchip you need to be clear why you are doing it. Is it purely for identification purposes for pet passports? Or is it also for recovery purposes if your pet goes missing. Without a reliable data base a microchip is meaningless for recovering lost pets. Both Identipet® and BackHome® have excellent website and phone apps with background support so that none of your information goes missing and it will always be available on-line to the veterinarian or shelter where you lost pet ends up. They have also improved their service in that the system will immediately alert you that your pet has been found. These apps can also take any medical history for your pet as well as indicate the pet’s local vet practice so that your pet can be transported there if you’re not available. You can ‘migrate’ all your pets onto the same system if you are using a combination of suppliers in your pet family. An additional tip is to place a collar with an ID tag as well as tags indicating that a microchip is placed. It is very hot and humid at the moment. Dogs lose heat via evaporation from breathing – the mouth and throat. Dogs at risk for heat stroke are those with flat noses and ‘crowded’ throats, which are inclined to snore. They can’t breathe sufficiently to allow evaporation when they are exposed to external temperature increases. Humidity decreases the amount of evaporation, so even if they are not in full sun, they can still develop heat stroke. Keep pets cool and schedule activity for early morning and late evenings. Make sure your kids are aware of the risks of playing with them in the heat of the day. I have seen some nifty jackets which are designed to cool dogs via evaporation. If your dogs seem to be overheated, immediately take them to a cool tiled area. Wet them to the skin with cool water (not ice cold) and place a fan across them to encourage evaporation. Alcohol on the skin also works very well to cool by evaporation. Additionally wrap ice blocks in cloth or paper and place them in the groin and armpits to cool the blood down in the major blood vessels. If you make the entire dog very cold you cause vasoconstriction and actually decrease heat loss. Get your dog to a vet as soon as possible, as they often need IV fluids after a severe event and can go into organ failure. Another seasonal hazard is fireworks. If your dog is scared, then you need to make a safe dark den area. Start medication early on – alprazolam is an excellent anxiolytic for this purpose, which you can get from your veterinarian. There are also some herbal calming medications available. Make sure you try them out before you actually need them to see if they work. Individual animals vary greatly in response to these medications. Applying pressure to certain areas on the body also seems to make a big difference. You can buy a Thundershirt®, which straps on and applies a gentle pressure to your dogs, which they find calming. 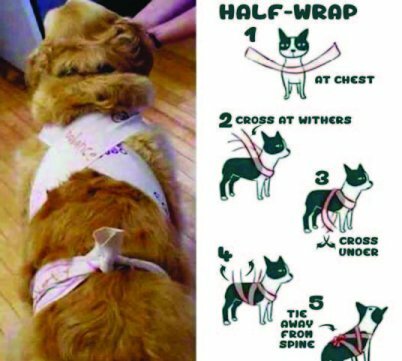 You can also make a thunder shirt by wrapping a piece of preferably stretchy cloth around your dog in a specific way. I have tried this on my Boerboel and have found it to be very effective, combined with an anxiolytic. Watch out for big glass windows and devils fork fences. We see lots of injuries to pets as they try to escape the noise. I hope you all have a happy, peaceful and safe holiday season with your friends and family.